Round trip airfare from Chicago. Accommodations at first class/select hotels based on two persons sharing in twin-bedded rooms with private bath (hotels & guest houses are used in Oberammergau). First class (Category 1) admission ticket to the Passion Play of Oberammergau. Comprehensive sightseeing throughout with a professional English-speaking tour guide. All hotel service charges, value added taxes, porterage where available and entrance fees per itinerary. Depart Chicago today on board your overnight transatlantic jet flights to Rome, arriving the following day. Enroute, enjoy dinner followed by a full-length movie. Your adventure begins as you arrive today in the Eternal City of Rome where you will be met and escorted to your waiting motor coach for the transfer to your hotel. Located in the center of the Region of Lazio, Rome is a reflection of every era. 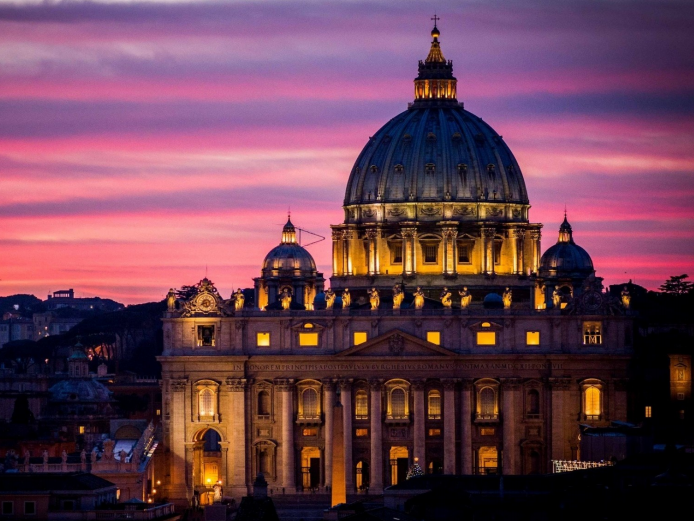 The wonders of Rome surround you…a world of art, history and culture that has been attracting visitors since the beginning of Western civilization. Your sightseeing tour this morning takes you to Vatican City. See the wonderful art treasures in the Vatican Museum and Gallery. View Michelangelo’s magnificent frescoes in the Sistine Chapel including the famous Last Judgment and The Creation of Man. This afternoon tour the remnants of “Ancient” Rome. Visit the mighty Colosseum and see romantic Trevi Fountain where legend has it whoever throws a coin in the fountain will one day return to Rome. Today’s drive takes you through the mystical province of Umbria to Assisi, the famous city of St. Francis. Born in 1182 as Giovanni di Bernardone, the legacy of St. Francis influenced religion and culture around the world. 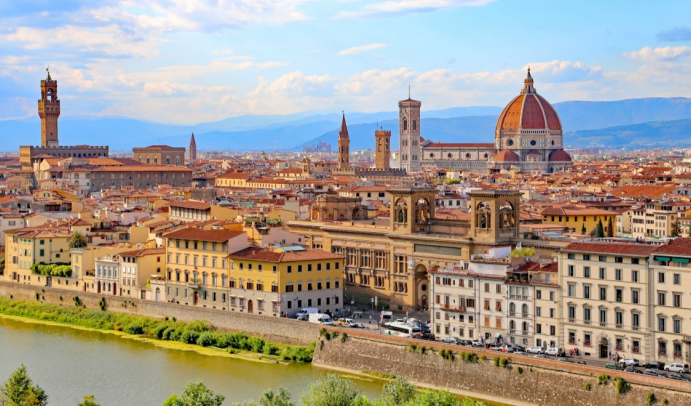 See the Basilica of St. Francis then continue your journey to Florence, the jewel of Renaissance Art and former stronghold of the Medici family. From Botticelli to Da Vinci, the city is unsurpassed in art treasures and the glory of its history. Spend tonight in Florence. Highlights of this morning’s tour include the Piazza della Signoria, where the Neptune Fountain stands, the Duomo and the Baptistry with its “Gates of Paradise” doors. To top it all, visit the Academia housing Michelangelo’s original statue of David. On to Piazzale Michelangelo for a panoramic view of the city and the Arno Valley. The afternoon is free in Florence to shop along the famous Ponte Vecchio and explore other Florentine delights. This morning drive to romantic Venice, built on 118 small islands lying some four kilometers from the mainland. The highways are made of water and the islands are linked by numerous, picturesque bridges. 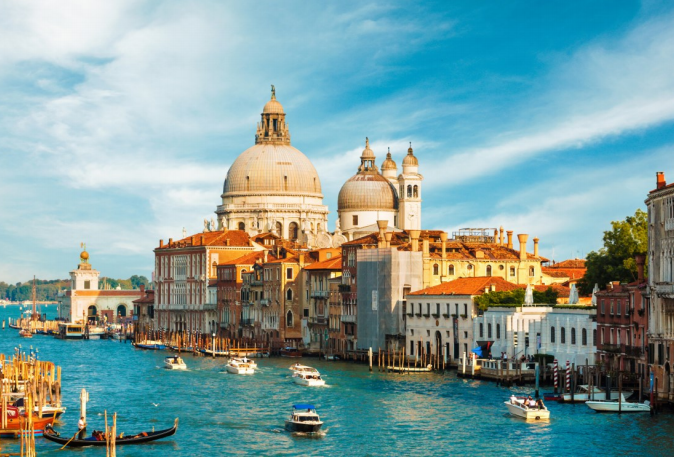 With its magnificent Byzantine architecture and maze of canals with their colorful gondolas, Venice is one of the world’s most glorious cities. Enjoy a walking tour beginning at St. Mark’s Square, the hub of activity for Venetians and visitors alike. Highlights include the rich, Byzantine Basilica San Marco, the pink and white marble Doges Palace and the Bridge of Sighs. Today’s journey is breathtaking as your scenic drive takes you through Italy’s Dolomite Mountains then the awe-inspiring Austrian Alps. Arrive Salzburg, said to be one of the most beautiful cities in the world. 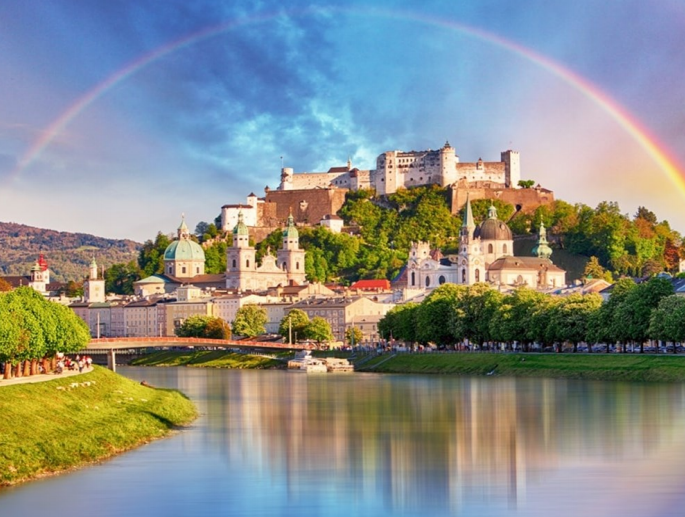 Featured in the movie The Sound of Music, Salzburg is a city of music and will always be remembered as Mozart’s birthplace. On your orientation tour this morning, see the Mozarteum, the house where Mozart lived, the Marionetten Theatre and Rathaus where Mozart was born. Visit the Church of the Franciscans and the historic Alter Markt in the Old City, a UNESCO World Heritage Site. Enjoy free time to explore this bustling city on your own. The highlight of your trip! In keeping with their 387-year old promise, the villagers of Oberammergau present their Passion Play depicting the last week of the life of Christ. The play’s presentation can be traced to 1633 when the Black Plague swept Europe. The people of Oberammergau took a solemn oath: if God spared them, they would present a day-long play depicting the last week in the life of Christ. 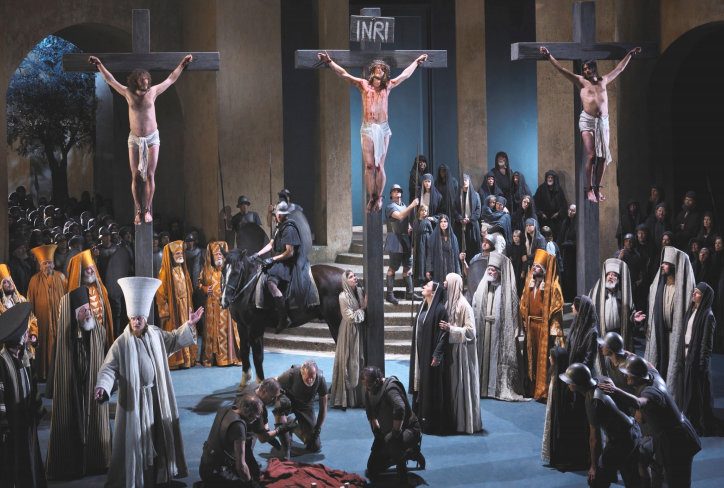 To this day they have kept their promise and every ten years the citizens of Oberammergau perform their passion play with the same love and devotion they have shown for over 380 years. Today the play takes place on an open-air stage with a covered auditorium seating 4,700, against a beautiful backdrop of towering Alpine mountains. This morning drive to Munich, the capital of Bavaria. 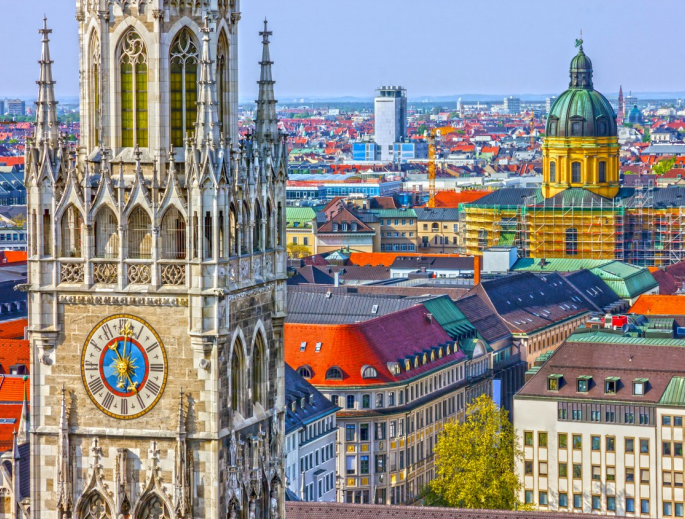 Munich was ruled for over 650 years by the Wittelsbacher dukes and kings, who left their mark on the architecture and founded the world-famous Munich art collection. See Marienplatz, Munich’s central square since the year 1158. View Nymphenburg, the former Royal Residence, Odeon Square with the beautiful Theatiner Church and the Hall of Generals. Overnight in the Munich area. All too soon your journey is over as you transfer to the airport and board your return flight home to the Chicago arriving the same day.